AMD brought back some genuine high-end desktop mojo with the release of the Threadripper CPUs. They offer lots of compute-centric performance and, handily, for a high-end platform, a massive amount of I/O on which you can hang numerous high-speed devices. Building boards on Threadripper's platform, known as TR4, is limited to just a handful of vendors, with AMD wanting to ensure that those companies in charge of TR4 board production know what they're doing. MSI is naturally on the list and has one board, the Gaming Pro Carbon AC, available right now. TR4 boards aren't, by their very nature, cheap. Maximising upon the CPU's peripheral potential and building around that huge, 4,094-pin socket and eight DIMM slots requires solid research and development. MSI tips its hat into the ring with the Gaming Carbon Pro AC, priced at £325 or so. That may sound expensive on first glance, but it is considered to be at the lower end of the TR4 scale, so let's see what you get. Eight DIMM slots, running in quad-channel mode, sandwich that huge socket. Keeping costs in check, there is no fancy RGB lighting behind them - a la Aorus - and LEDs are limited to four sections - the larger CPU heatsink, around the audio section, on the southbridge, and underneath the SATA ports. If you want more, there are two four-pin header for RGB LED light strips, and in a move that is gaining traction, the heatsink covers can be changed - MSI, too, is jumping on the 3D-printed bandwagon. 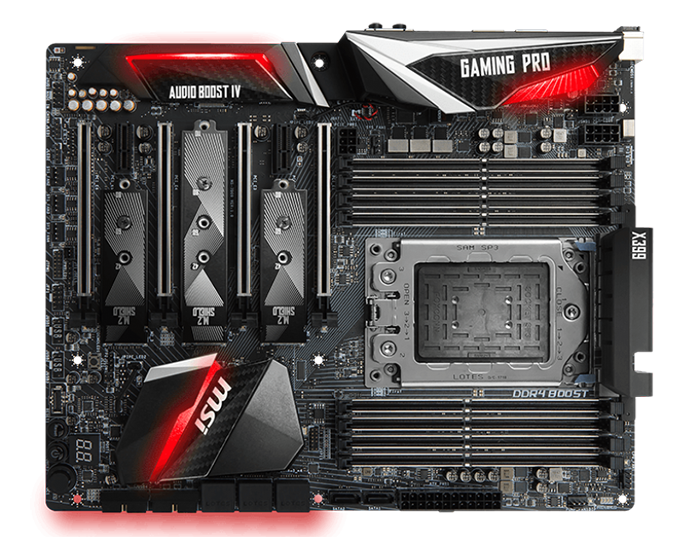 Speaking of heatsinks, the limited board space means that MSI goes tall, really tall, on the two that surround the CPU socket. That said, there's no problem in mounting TR4-compatible coolers. Going strong and also continuing recent trend, the DIMM and PCIe slots are all strengthened. As usual, these high-end boards require two EPS cables on top of the main 24-pin, so make sure that your PSU is up to the task. There's also an additional six-pin connector for specific extra power to the PCIe slots. MSI says it employs a 13-phase power regulation circuitry in order to aid stability, especially when running overclocked. 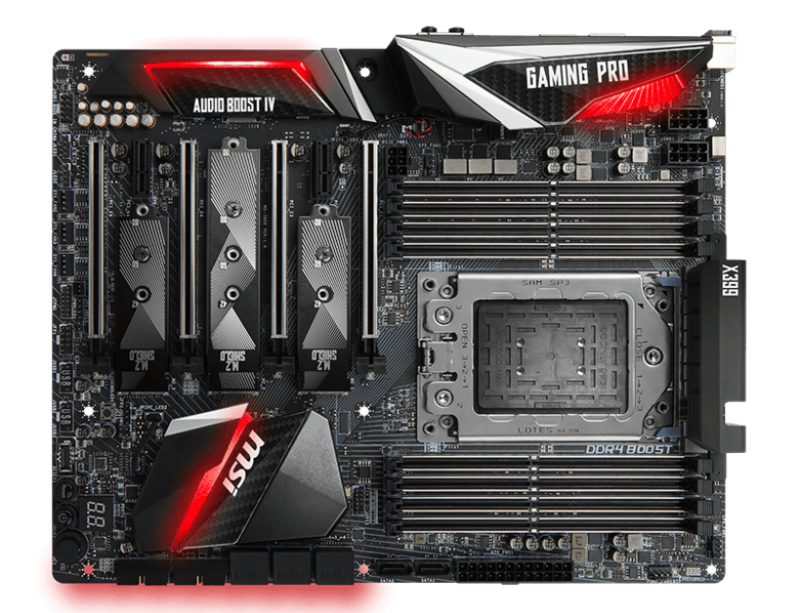 Given the amount of high-performance gear you can install, MSI adds six four-pin fan headers around the board, all located in sensible areas. A key driver of the TR4 platform is the flexibility arising from having a CPU with 64 PCIe lanes on tap. MSI uses these to power four x16 PCIe graphics slots, offer a trio of M.2 (only one is the super-long 22110 form factor) in between, and then add a further two x1 PCIe. This means the board supports four-way SLI and CrossFire, but even Threadripper cannot run the full complement of PCIe and M.2 without making some compromises, though MSI doesn't make clear the reduction in protocol speeds when everything is populated. 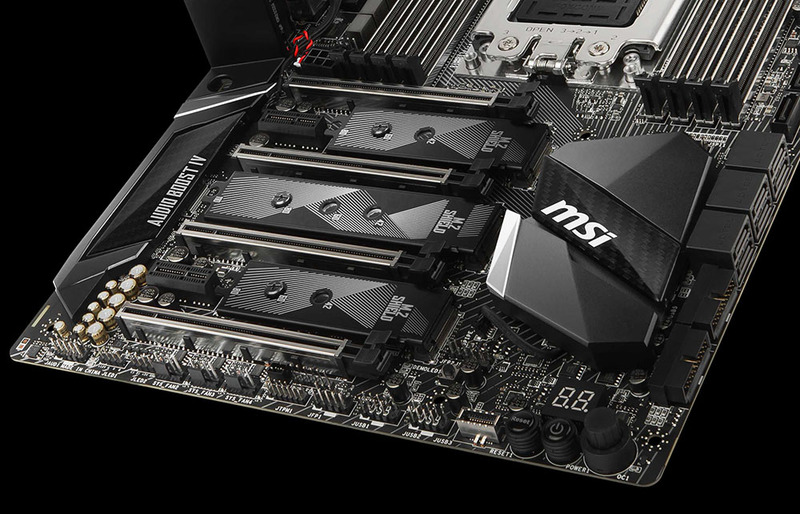 We reckon two of the four PCIe x16 slots run at x8 electrically. In keeping with a recent trend, the M.2 slots, riding off the PCIe bus but also supporting older SATA, have specific heatsinks in order to stop the drives overheating and reducing performance. Speaking of SATA, MSI also provides eight regular ports, meaning that storage really isn't an issue with this board. X399 is a good case of packing as many features as possible. MSI manages this on a standard-sized ATX board. To the designers' credit, even with so much going on, it doesn't feel overly cramped. Said features include the now-obligatory debug LED, onboard buttons, an 'OC knob' offering multi-position easy overclocking - keep turning for higher speeds - a USB 3.1 Gen 2 Type-C connector next door, and a gaggle of fan headers. It's sensible that MSI puts everything down here as there are no obstructions if using multiple long graphics cards. Coming across the board and keeping the specs flowing, this best-of-breed MSI continues to use Audio 4 Boost technology in concert with Nahimic 2 software. Underlying the hardware is the popular ALC1220 Codec that almost everyone uses, so we consider this offering to be on a par with Asus, Gigabyte, et al. Another tried-and-tested solution is found with respect to USB connectivity. ASMedia's 3142 chipset offers both a Type-A and Type-C (non-Thunderbolt-compatible) Gen 2 port on the rear, underneath the single LAN, and these ride off the PCIe bus and hook up to the X399 chipset. The processor, meanwhile, has its own array of storage goodness, meaning the two columns of four red-coloured ports all run USB 3.1 Gen 1 (or USB 3.0 by another name). Though it may not seem so but you can intimate from the name, the board also supports wireless connectivity through a PCIe x1 card bundled in the package. It uses the Intel Dual Band Wireless-AC 8265 card (867Mbps) and also combines Bluetooth 4.2. Intel further provides the Intel I211 Gigabit LAN, but unlike, say, a Killer solution, the two cannot be paired for extra networking performance. We feel that MSI's decision to go big, but not crazy, on features is a good move. One could add extravagant triple-shot networking, offer crazy lighting, or include features you are unlikely to use, thus pushing up price towards £500. The firmware, meanwhile, is the same Click BIOS 5 as the X299 SLI PLUS version. As we commented at that time, MSI's implementation feels a tad more disjointed than others - having to reboot to enter M-Flash being an example - and a number of on-screen animations make the interface appear a fraction slower than the competition. Still, most of it is repeated via utilities within the operating system.